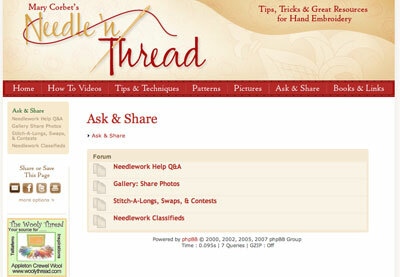 Needle ‘n Thread “Ask & Share” is Here! 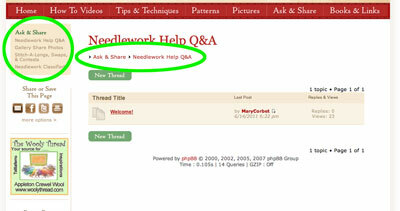 Yesterday afternoon, the “Ask & Share” section here on Needle ‘n Thread went live! 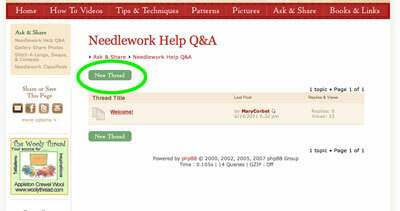 2016 Update: The Ask & Share Section on Needle ‘n Thread is view only now. You’re welcome to browse through it, but it is no longer functioning as an active forum. I’d like to give you a little overview of this new site feature, so you can see how to use it and what it can do for you. You can access Ask & Share from any page on the website, through the link in the top menu. When you access Ask & Share from the main menu, you’ll arrive at this “introduction” page, where you can read a brief description of each section. Each title on this page is a link to each section of Ask & Share. You can click on whatever title interests you, and enter the “forum” area for that section. Inside the forum area, you’ll see all the “threads” of the various topics that are currently active in that particular section of Ask & Share. These topic threads are arranged with the most recent and active topics first. (There aren’t very many topic threads right now!) You are welcome to view the various topic threads and responses without registering in the Ask & Share forum, but if you wish to participate by asking or answering questions, posting pictures, joining in a stitch-along, etc., you’ll need to register. You’ll be prompted to register or sign in, when you click the “New Thread” button. In any section of Ask & Share, if you wish to propose a new topic, just click the “New Thread” button. If you wish to join in on a topic already underway, just click the “Reply” button, which is found within each topic thread. Navigating through Ask & Share is easy. In each forum section, you will see a line of “breadcrumbs” above the topic threads. These tell you where you are, and provide links back to the original forum page. Also, for your convenience, there is a navigation menu at the top of the left column, with links to each sub-section of Ask & Share. If you click on Ask & Share from the navigation menu, or from the breadcrumbs above each topic thread, you will arrive at the main forum page, where you can see the main sections of each forum and click into whichever you want to visit. If you haven’t registered or signed in to Ask & Share, you’ll find a convenient log-in prompt above the main forum. If you have already registered, just sign in with your username and password. If you haven’t registered, click the “Haven’t registered” link, and you’ll be taken to the registration page. All information submitted in the registration process is private & none of it will be used for nefarious purposes, I promise! Once registered, you’ll be able to participate in any section of Ask & Share. Later on, the Online Classes link will also become visible on the Ask & Share menu. To participate in the online classes, you have to be registered in Ask & Share and go through the sign-up process when the class is announced. That section will go live when the first class is announced. Can’t wait! 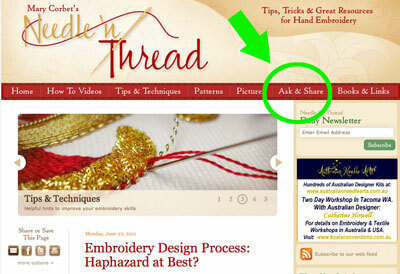 Ask & Share is a simple solution for participating on Needle ‘n Thread. 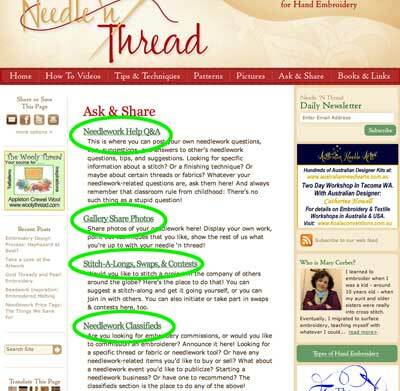 You can join in discussions, ask questions & get answers, participate in & propose stitch-alongs & so forth, post pictures of your own work, or get the low-down on needlework resources and happenings in the Classifieds section. I’m sure you’ve noticed that Ask & Share is not a full social network – and it’s not meant to be. It’s simply for the exchange of needlework-related information and for participation in needlework-related topics and happenings. I thought about going full-fledged with a social networking set-up, but there are already some excellent social networking sites for stitchers out there. Instead, I wanted to keep things simple, while still having a spot to interact. 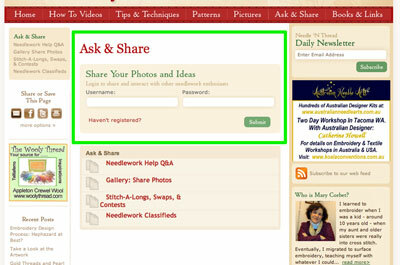 For those who don’t participate in social networks or don’t want to, Ask & Share provides a streamlined, simpler solution for interacting with other needleworkers online. Concerning Ask & Share and the regular Needle ‘n Thread Blog – no worries there! I’ll still be doing the same thing on the blog! I’m looking forward to meeting you over at Ask & Share! Oh, boy! I can see now I won’t be doing much house work…I love reading people’s comments, questions, answers, etc., in the new “Ask and Share” section. Congratulations on a top quality addition to your already very professional website. I wish you lots of success and many blessings. Thank you for all you do for us out here, Mary. Thank you so very much for taking the time to do this. I can now direct my questions to the “open forum” instead of pestering you on your own email address, which, heaven knows, HAS to be overloaded enough without being glutted with members particular questions…..great idea ! ! I’d say that your Ask & Share is a big hit! I enjoyed browsing thru all the different areas and loved the photos that everyone posted of the different types of handwork that they’re doing! We are so Blessed to have you! 1. will events that have gone by be deleted? 2. is there any way to have tags or something attached? Say “Dec 2011” & “Virginia” for example. That way it might make it easier to find events that we can get to, or make special plans to get to. At least I’d like to think that there will be so many entries that we’d have trouble finding what’s going on if events are listed by when the post was made :). If not, no biggie – we can always make a note on a calendar! I love your ‘Ask and Share’ addition. Thanks for providing all the wonderful embroidery information, inspiration and fun! This is awesome! Thanks sooo much Mary! I signed up few days ago and tried posting under de SAL category, replying to the Wip-along thread however even though I tried posting 3 times already the messages are not showing. It only says that the message will be moderated and I will be let know when the message posts. Are the replies suppose to show automatically/immediately? Is that how it works… or am I doing something wrong? Thanks Mary for explaining me how it works ;-)! Sorry for crowding your inbox :-(. Previous Previous post: Embroidery Design Process: Haphazard at Best?